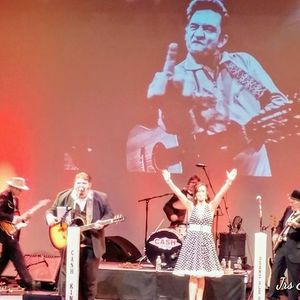 CASH is KING : Johnny Cash Tribute Show Returns to Teresa's Restaurant in Ware, Massachusetts on Saturday October 20th !! 315 Palmer Road Ware MA 01082 413.967.7601 Tickets $50.00 per person Includes 6 Course Family Style Dinner, Show, Tax Gratuity and Parking .. Call 413-967-7601 To Get Your Tickets !! OR Purchase them Online Here: https://www.brownpapertickets.com/event/3581503 5:00 pm Reception Hour of Appetizers Consisting of Cheese, Crackers & Fruit and Cash Bar.. 6:00 pm Family Style Dinner 8:00 pm Cash Is King Show Cash Is King - The Music Of Johnny Cash, June Carter & The Tennessee Three. Legendary Country Rebel Johnny Cash comes to life in “Cash Is King" – The Ultimate Johnny Cash Tribute on Saturday October 20th at Teresa's Restaurant and Banquet Hall ! Cash Is King returns to the stage performing decades of Johnny greatest hits including -- "Folsom Prison Blues", "I Walk The Line", "Ring Of Fire" and many more ! Johnny Cash is portrayed by the spot-on Brian Chicoine who will amaze as he sings, plays and tells the story of Johnny Cash's life. His voice bears an uncanny similarity to that of the legendary singer. Last but far from least is June Carter portrayed by Vicky St. Pierre, who performs the classic duets complete with the sass and style of Johnny's wife ! With period costumes, cover versions of Cash classics and between-song banter, Cash Is King is the True Johnny Cash Experience.